Yummy muffins named for a special Havanese, Jomarans' Rgamuffin. In blender, liquefy liver with broth, oil, honey and garlic powder. In a large bowl, mix together 3 cups of the flour and the wheat bran. Make a well in the center of the dry ingredients. Pour in liver mixture and stir well. Add in the last cup of flour, a little at a time, kneading by hand to form a firm dough. Let dough rest 10 minutes. Pat out on a floured board to about 1/4 inch thick. Cut out with cookie cutters. Place on cookie sheet sprayed with non-stick spray. Let air-dry for 30 minutes. Beat one small egg with 1 tbsp. water and brush cookie tops to glaze. Bake at 350 degrees for 20 minutes. Reduce heat to 200 degrees and bake for 1 hour longer. Turn oven off, but leave cookies inside a few hours to dry. This recipe (and image of Rags) was provided by Suzanne McKay. 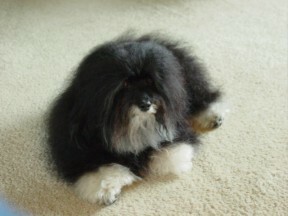 Find more of her recipes at http://havaneseabc.com/treats.html or visit her website, an in-depth look at everything Havanese at http://havaneseabc.com. Suzanne is also an award winning author, you can check out her latest works at http://www.woofwags.com/.